Watersheds are defined by the natural boundaries of a surface runoff area. A watershed encompasses all the lands that drain by sheetflow or stream flow to a common waterbody such as a lake, river, estuary, lagoon, or ocean. When rain falls or snow melts, the liquid water either flows downhill until it eventually reaches a lake with no outlet or the ocean, or percolates through the soil and replenishes groundwater. As runoff flows downhill (or downgradient in the case of groundwater), the once-pure snow or rainwater picks up pollutants, sediment, and debris. As a result, physical, chemical, biological, and human activities within a watershed can directly affect water volume and quality, land value, and various natural resources. 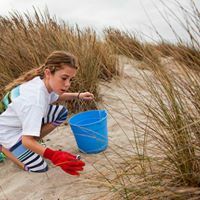 Since passage of America’s federal Clean Water Act in 1972, regions throughout the country have made significant progress in protecting and restoring the health of the nation’s waters. Much of this progress is a result of tighter controls on pollution from industry and sewage treatment plants, with some improvements a direct result of citizen involvement and volunteers who serve to improve the water quality in their local or regional watershed. A good example is Ventura County’s Annual Coastal Cleanup Day (most recently held on September 15, 2018) when nearly 2,900 volunteers removed almost 12,000 pounds of trash and over 700 pounds of recyclables from 43 miles of our local coastline. Despite these public and private efforts, about 40 percent of our nation’s waterways are still unsafe for fishing or swimming. 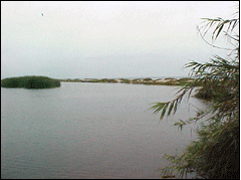 While pollution from factories and sewage treatment plants, soil erosion, and wetland losses have been dramatically reduced, runoff from city streets, rural and agricultural areas, and other diverse sources (commonly referred to as non-point sources) continue to degrade the environment, thus putting drinking water supplies, aquatic habitats, and other water uses at risk. Today’s problems call for more creative, comprehensive solutions. In recent years, the U.S. Environmental Protection Agency (EPA) has joined with other public and private entities to promote community-based watershed management programs as a means to further restore and maintain water quality, protect sensitive habitats, and preserve land resources. In particular, the EPA has been working with federal, state, and local governments to customize activities and services for local watersheds and affected groups. 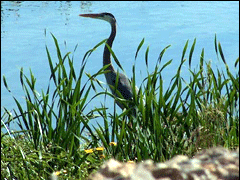 A watershed management plan is one strategy for effectively protecting and restoring aquatic ecosystems, protecting human health, and preserving other natural resources. This strategy is based on the premise that many water quality, ecosystem, and land resource problems are best dealt with at the watershed level rather than at the individual waterbody (e.g., aquifer, lake, pond, or river segment) level. Major features of a watershed management plan are identifying and assessing priority problems, encouraging a high level of stakeholder/local resident involvement, and measuring program success through monitoring and other data gathering. 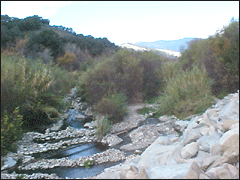 The Ventura River and its tributaries comprise the major watershed in Zone 1 in the western portion of Ventura County. 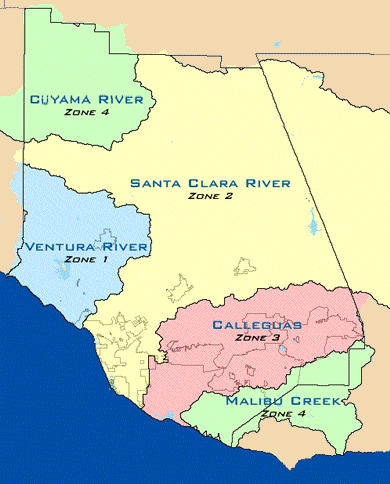 The major river in Zone 2 is the Santa Clara River with a watershed area of approximately 1,634 square miles. 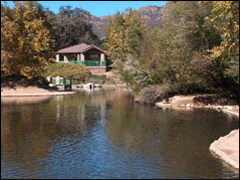 The major river in Zone 3 is Calleguas Creek with a watershed area of approximately 341 square miles. Zone 4 has a total of about 225,000 acres divided between several unconnected areas. The southeast area includes 61,000 acres of the coastal drainages of the Malibu Mountains (including Malibu Canyon, Lake Sherwood, Potrero Creek, and Westlake; also known as Russell Valley Basin, Conejo Valley Basin, and Thousand Oaks Basin). For purposes of adequate stream coverage, this page also includes that small portion of Zone 4 drainage area unofficially known as the Las Virgenes Canyon Basin. Zone 4 has a total of about 225,000 acres divided between several unconnected areas. This page however, will only focus on the largest portion of the Zone 4 drainage area that covers the far Northwest corner of Ventura County. 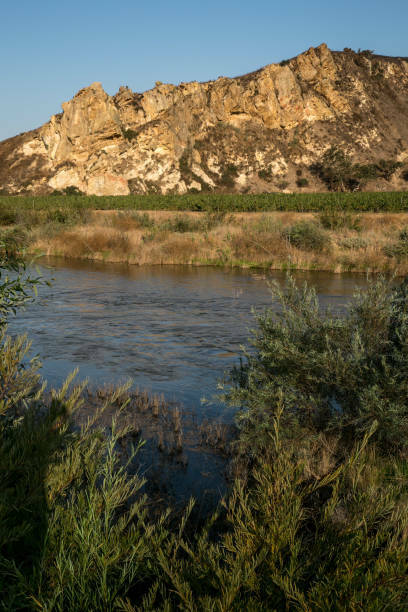 An area known by the local stream name, ``Cuyama River`` (also includes the Quatal Canyon drainage and lands called the Cuyama Badlands). 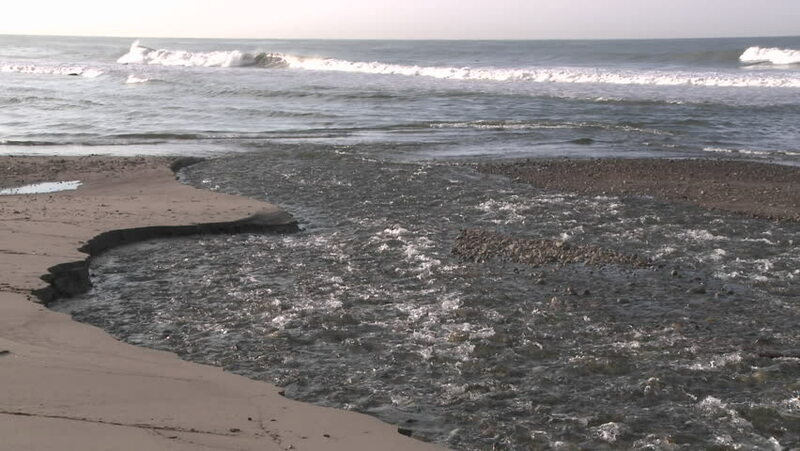 From the time the Watershed Protection District became steward of the County's watersheds, it was recognized that the areas near our coastline, draining to the Pacific Ocean, should be considered for their unique characteristics in watershed planning.